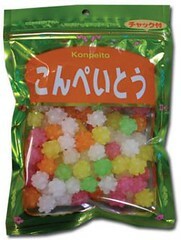 Yestarday at 888 International Market we picked up some konpeito, which is the stuff that the woman feeds to the soot sprites in Spirited Away. So we are watching Spirited Away eating them. They are literally pure sugar with a touch of food coloring.